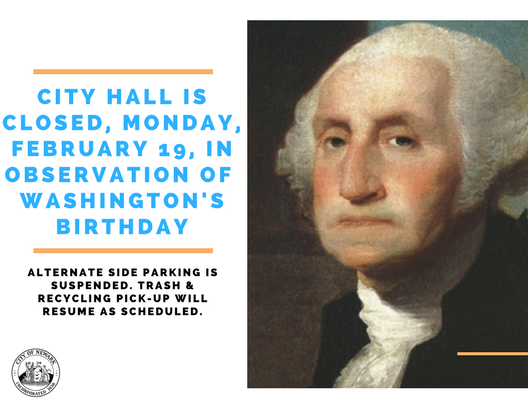 Mayor Ras J. Baraka reminded residents today that City Hall will be closed, and all non-emergency Newark municipal services will be suspended on Monday, February 19, 2018, in observance of Washington's Birthday. Police, Fire, and other uniformed emergency services will work as usual. Additionally, there will be trash pick-up as regularly scheduled on Monday, February 19. There will be trash pick-up as regularly scheduled on Monday, February 19. Residents whose trash and recycling are picked up that day must place their refuse and recycling at their curbs for pick-up by 6 a.m. The Department of Health and Community Wellness’ inspection services, transportation for seniors, and health clinic, will not operate on Monday, February 19. In addition, the Bureau of Vital Statistics will be closed. Residents will not be able to apply for permits, birth certificates, name-change certificates, marriage licenses, nor pay water or tax bills at City Hall.